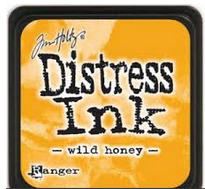 Ranger and Tim Holtz are very excited to announce the addition of Mini Distress Ink Pads! Ranger has taken the same unique, water-based dye ink formula used in the full size Distress Ink pads and has put it in a convenient stackable 1” x 1” pad. The same unique, water-based dye ink formula used in the full size Distress Ink Pads in a convenient, stackable, 1"X1" pad.